Deciding to add value to your home with a new kitchen is a big and often costly decision to make but is also a great way to increase your chances of selling your house. It is to view fitting a new kitchen as a way to increase the long-term chances of you selling your house quickly, as opposed to only increasing value. When you do decide to move to your next home, a fresh kitchen with modern and efficient appliances will be a big tick for any potential buyers. Enjoy more time in it! Until you do move having a new kitchen can enhance your house and provide you with a new focal point to your home and can provide the great enjoyment that comes with having a new space to relax or entertain in. Did you know that well designed rooms can have a positive effect on wellbeing? This means a new kitchen could make you feel better mentally and emotionally. Not only does fitting a new kitchen make you feel better and add quality to your lifestyle, it can also add value to your home. Research by consumer watchdog Which? shows a new kitchen costs on average £8,000 but could add around 6 per cent to the value of your property. Kitchens are often the first thing a buyer looks to replace, so if you can provide a ready-made, attractive space, buyers may be willing to pay more to save themselves the hassle of installing a new kitchen. A big change in recent years has been the trend for open plan kitchen, dining and living spaces and so renovating your house in this way will not only attract more buyers, it may persuade some to pay more money to ensure a sale. So if you want to revamp your home and inject some modern and spacious living into your kitchen, we can help. We have the knowledge and expertise to advise you on the best style and design for you and your house and with our extensive range available to view at our Leicester showroom you will be guaranteed to find a kitchen that is right for you. 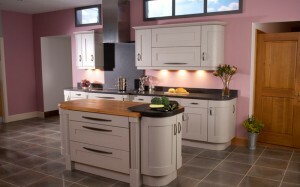 Contact us today on 0116 255 5745 or fill out our online form to enquire about your dream kitchen.